Average rating 5 out of 5 from 372 reviews for A Gastronomic Tour of Sicily, according to AITO reviews. Day 1: Our hotel is on the island of Ortygia, the UNESCO World Heritage site at Syracuse’s heart, about 45 minutes from Catania airport. Welcome drinks and dinner as we introduce you to some of the tastes and flavours of Sicily. Day 2: The day begins with a drive to Palazzolo Acreide, a charming small town with a wealth of baroque architecture, where we visit the Archaeological Park and the impressive and evocative ruins of the ancient Greek settlement of Akrai. Afterwards we head to a nearby olive farm where the owners are producing award-winning organic extra virgin olive oil from native, centuries-old, olive trees. We tour the farm before enjoying a wonderful lunch of local delicacies which have been carefully selected to perfectly compliment a special tasting session of this unique olive oil. We return to Ortygia in the late afternoon and, after a brief rest, enjoy a Sicilian wine-tasting aperitivo with a local expert Sommelier. Day 3: We meet our culinary expert for a stroll through Ortygia’s bustling food market. Under his guidance we sample the local produce in preparation for a private cooking class in his restaurant. In the afternoon we will explore the city’s long history and visit the Syracuse Archaeological Park before taking a walking tour of the temples, churches, graceful town-squares and meandering streets of the historic centre as the sun sets. Day 4: The day begins with a tour of the beautiful baroque town of Noto, including a Granita tasting in one of the renowned local cafes. Later we head to an artisanal Almond and Ricotta Cheese Farm were the owner has devoted himself to traditional farming methods. We take an exclusive tour, watch the cheese making and the grinding of the almonds to make almond milk before experiencing a true, rustic Sicilian lunch. In the afternoon we head for Ragusa, check in to our hotel and take an early-evening stroll around the historic centre of Ragusa Ibla. Day 5: A day to delight the senses begins with a walking tour of the Historical Centre of Scicli, and a visit to a beautiful herb farm for an aromatic tour that will inspire cooks and gardeners alike. The visit will conclude with a tasting lunch, on a terrace overlooking the beautiful southern coast. In the afternoon we will stroll through the streets of Modica and witness a demonstration of traditional Modicano chocolate making, with plenty of opportunity to taste the many delicious flavours and a variety of other delectable temptations. In the late afternoon we return to Ragusa. Day 6: We journey to Vittoria to visit a fabulous winery where the owners have spent the last decade rediscovering the ‘Ancient Grains’ of Sicily. This devotion to returning to the healthy and wholesome approach, so much the backbone of Sicilian food culture, shows us techniques that are steeped in the history of the island. After a tour of the vineyards where the wines are produced using traditional methods and aged in clay amphorae, we meet up with our expert chef and roll up our sleeves for a pasta and bread making cooking class followed by a splendid lunch. After lunch we continue on to Mt Etna and check into our hotel. Day 7: We spend the morning walking on Mt. Etna in the company of an expert volcanologist. We’ll stroll through verdant woods of pine and silver birch before ascending to a lunar landscape of lava flows and ash filled craters with incredible views all around. Afterwards we visit a local winery to enjoy a rustic lunch and sample the award-winning wines that thrive on Etna’s slopes in the company of an expert Sommelier. A last chance to relax, then a sumptuous farewell dinner. Check in time at your hotel in Syracuse is after 14:00 so we recommend choosing a flight that arrives mid to late afternoon. Check out time from your hotel is 11:00 am. 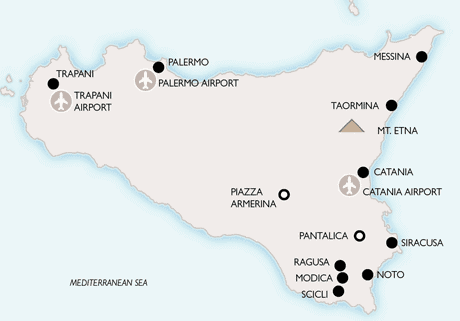 We will arrange local transfers from Catania airport and to Catania airport at the start and end of the tour. The cheapest way to book flights is with the airline online. Excellent. A perfect blend of history and architecture blended with food and wine. A true immersion in Sicilian culture. We felt like Sicily was opened us in a way that only our guides, Marcello and Lucia could have accomplished. We have been traveling internationally for nearly 25 years, often multiple trips a year. No other trip exceeded our week in Sicily. We hated to leave. Excellent. Our best tour operator yet. The itinerary was carefully thought through and well balanced. The trip represented great travel for the cost. Our booking was easy, the pre-information packet was timely and thorough. Interim questions were handled promptly and thoroughly, including going out of their way to help us with some hard to get reservations. The transfers were perfect and done with a high class Mercedes vehicle. Everything worked like clockwork. However, it was the genius of the itinerary, coupled with our two passionate professionals, Marcello and Lucia, that put this trip into the A plus category.